I was grown before I read To Kill a Mockingbird by Harper Lee. It was eighteen months ago in fact. I think Daddy had suggested that Aub read it, so I had gotten it and had it around the house. After Daddy passed in November 2011, I found it hard to concentrate and read any book. But I pulled it out in the summer of 2012 and I opened the pages of a book that I will forever and always treasure. So many lines that touched my heart. If I put them all down here for you, then well, I’d practically have the whole book written out for you to read. If you haven’t read it or you only read it as a young person for a school requirement, I highly recommend your making time to read it now. Because it’s important. It is an important story whose lessons we must never forget. We cannot afford to forget them, for to do so would send us back in time to a place that was hard and ugly and broken. More so than things are today. 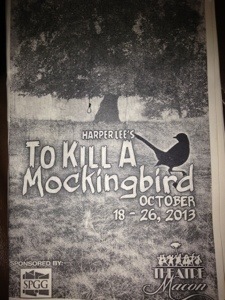 Several weeks ago Aub found out that “To Kill a Mockingbird” was coming to one of the local theaters in Macon. She could attend with fellow students as part of a community enrichment program. She was thrilled and so was I. I was excited when she made the list to attend. The performance was set this past Friday. All of the tickets were sold out, so I was satisfied to enjoy it vicariously through her. However, she called me in the middle of the day and said the program had an extra ticket and I was going. What a wonderful gift! To see one of my favorite books performed in live theater, and that my oldest wanted me to join her. The playbill from the performance we attended Friday night. It was phenomenal! When we arrived in downtown Macon, it was already dark and the town had a festive feel to it. The theater was full by the time the lights went down and the play started. Oh how I do love live theater! Before the play began, we looked through the playbill to see that we recognized a couple of names. We knew that one of Aub’s high school classmates was playing Mayella Ewell. I knit with the stage director, and I had taken a directing class from the director back when I was in college. What a small world. I was immediately taken in with the story and the way it was presented. The choir added a spiritual feel that set the whole story in motion. The adult Scout as narrator was a talented actress whose voice carried you back in time as young Scout came onto the stage. It was absolutely wonderful, and I loved every minute of it. Except. I’ve read the book. I know the word is in there. Much of the book deals with prejudices and the idea of fairness and justice and the goings-on surrounding a trial for a young black man who was accused of behaving inappropriately toward with a young white girl. So I knew to expect it. The first time the “n” word echoed across the theater, I sucked in my breath. I felt as though I’d been kicked in the stomach. I haven’t heard that word for at least fifteen years. In my previous life I heard it all too often. What the use of the word represented is one of the reasons that is my previous life. I could not and would not raise a child in such prejudice. And so I didn’t. Each time during the play the word was said, and it was never whispered, I nervously looked around. I was surrounded by Wesleyannes, students from Wesleyan College, many of whom were international students. What must they be thinking, I worried. Are they offended? Upset? Growing up, I knew we weren’t allowed to “cuss.” But I also knew we were NOT allowed to say that word. Cussing reflected poorly on you and might could offend someone, but saying that word only served to hurt people. And we were not ever to do that knowingly. Such a beautiful and thought-provoking performance. I mean, it was fantastic. At the end when the young man belted out a solo of “I’ll Fly Away” and was then joined by the choir and then the entire cast–TEARS. Streaming down my face. I really was trying not to embarrass my oldest in front of her fellow classmates, but there was no helping it. I love that song. And I thought of Mama and Daddy and so many others. That song. Beautiful. That made me sad. And mad. “I better not hear you saying it. Ever.” And I meant it. In the past couple of months, I’ve read Ann Hite’s three books, but Low Country Spirit dealt with what happened during the Civil War in the south from the perspective of different slave women. I know she researched it thoroughly, and there were no exaggerations. I went from there to reading Whistling Past the Graveyard, which is about nine-year old Starla, a young white girl in Mississippi who winds up travelling from there to Nashville with Eula, a black woman, and a white baby she found on the church steps in 1963. After finishing that book (an excellent story by the way), I started “Silver Sparrow” by Tayari Jones, which is the story of two young African-American girls living in Georgia in the 1970s and 1980s. I was nearly finished with that book when I saw the play Friday night. So much hurt has happened in our country, especially this part of the country, in the name of race and judging others about their outward appearance. Weighs heavy on my heart. The adult Scout kept talking about something that Atticus wanted her to do. And that was it. To stand in someone else’s shoes and walk around a bit. It’s not an easy thing to do by any means, but it is where grace comes from, and it can make us better people and the world a better place to live. I now realize this is what my Mama lived by. Daddy too. The hard truth. Live it now in this world. Try bringing a little of the next world into the here and now. Isn’t that what we’re supposed to be doing? Indeed it does. 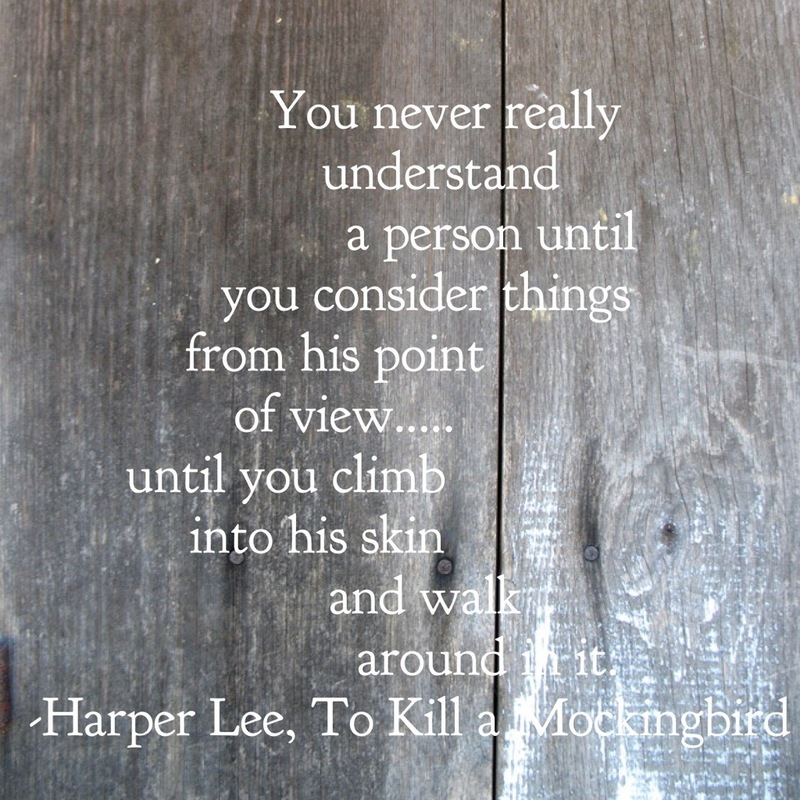 Or, in the words of Harper Lee….. The final lines of the play were Atticus and Scout talking after the night when Scout finally figured out about standing in someone’s skin. And that’s what it’s all about, isn’t it? 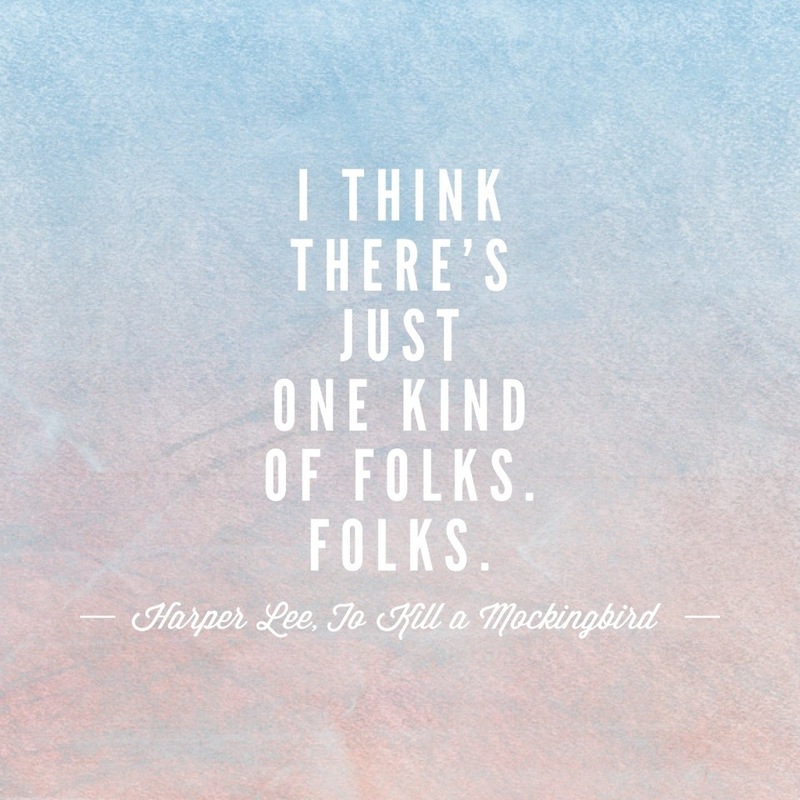 It takes all kinds of kinds, but in the end, there’s only one kind. Us. More alike than different. If only we could make it a habit of stepping in the other’s skin for a few minutes, I bet we’d be surprised. To really see the other person. No it won’t be easy, and yes, my whole being is bucking me on this. I don’t want to know what they’re like on the inside, I’d rather just keep on not liking them. I’ve seen enough from the outside looking in. If I take a minute to think about what it’s like to be them, then I might change my mind and my hard heart might soften and I might have to change my thoughts about who they are…..and oh, yeah, we might actually get along. And my children, who are always watching, will see it too. What I do counts four times–once for me, and then once for each time it imprints on my children who see my actions and hear my words. I have to remember that. 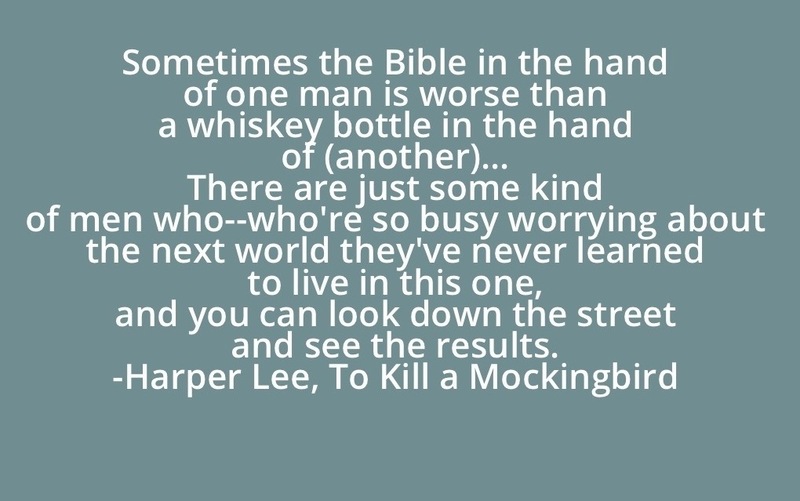 It touched me when Atticus Finch talked about how what he did he had to do or he couldn’t raise his children, couldn’t have them watching him do the easy thing, it had to be the right thing. It’s true. They’re watching. And so I re-commit myself to the idea of acceptance and tolerance and most likely I will get my copy of this book back from my oldest and settle in to re-read it for a spell. It’s one of those timely stories full of good wisdom and I expect I’ll likely find something new every time I revisit Maycomb, Alabama. In the meantime, if you haven’t already read it, join me. If you have, I’d love to hear your favorite parts. And if you are local, good news–the play has been held over and there will be shows on November 1 and 2 at 8 p.m. each night. You can find out more and order tickets here. This became on of my favorites when Maria had to read it several years back. I am so thankful that it has been used so much lately to get me through this season of my life. I know, it’s one of my favorites too. I am glad you told me how much you had enjoyed the play, because that was the last kick out the door I needed to make myself get it together and go. And I so loved it. Thank you! You used Miranda Lambert. You are my favorite Mama. I would point out the obvious but that would seem futile. You are my favorite oldest. And you know I’ve loved that song for always.